The intervertebral disc lies between successive vertebral bodies from the second cervical vertebra downwards. They are composed of fibro cartilage. The outer portion of the disc is composed chiefly of concentric rings of fibrous tissues, the annulus fibrosus. The annulus is composed of layered sheets of collagen fibres. Each collagen fibre originates around the circumference of the vertebral end plate passing to the adjacent vertebral end plate at a specific angulation (approximately 30degrees). The central portion of the disc is softer and gelatinous, the nucleus pulposus. The nucleus is homogenous and elastic. It is centrally located within the fibrocartilagenous covering, the annulus fibrosus. The nucleus is predominantly a mucopolysacchride matrix containing a network of fine bonded fibrils. They are layered in a random manner, usually interlocking at 60degrees angle. 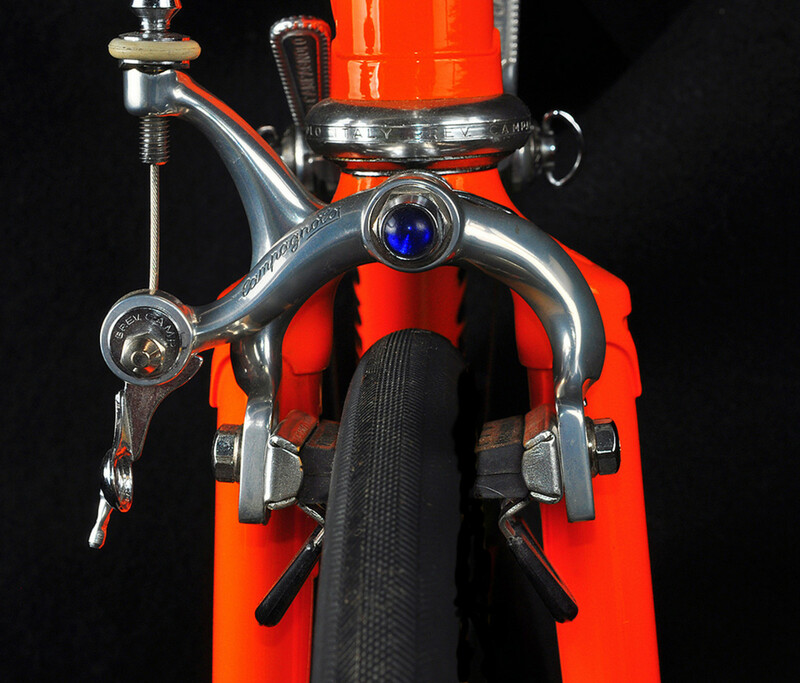 This structure imparts tensile strength to the disc against deforming forces. This structure also accounts for its elasticity and tensile strength. The nucleus undergoes physical and chemical changes with ageing and from mechanical injuries. These changes adversely affect the function of the annulus also. The mucopolysaccharides of the matrix of the nucleus undergo degradation and the get reformed into an inferior type of polysaccharides. This degraded and reconstituted polysaccharides absorbs excessive water. But it cannot retain this excessive within the matrix. The genetic, metabolic, endocrine and mechanical failure of the annulus may contribute to the degradation of the mucopolysaccharides. The above explained phenomenon may cause the disc to swell and then to degenerate. 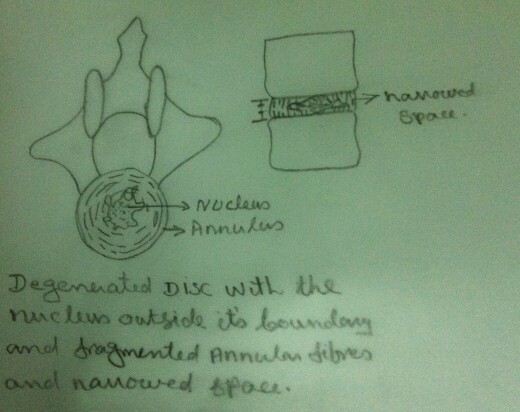 The Mechanical Failure of the Disc- The annulus fibrosus. The annular fibres composed of collagen fibres undergo fibrillation. These fibres lose their integrity. Hence it loses its flexibility, which enhances the possibility of disc failure. External physical forces enhance these changes and increase the rate and extend of failure. Usually a compressive force fractures the vertebral endplates before the force injures the annulus. The excessive flexion and extension of the functional units are well tolerated by the annular fibres because of the presence of anterior and posterior longitudinal ligaments. 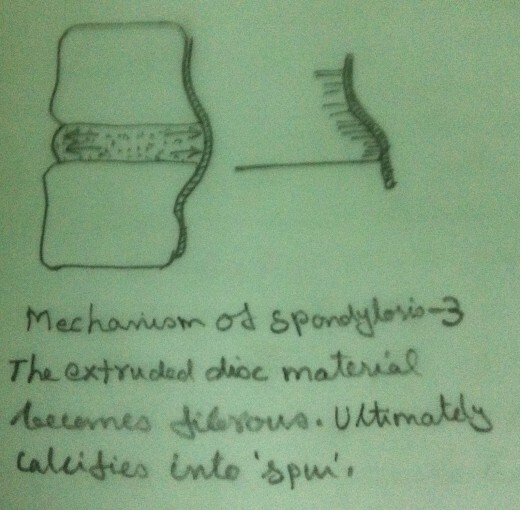 The excessive rotatory movement is limited by the elongation of the annular collagen fibres of the disc and the mechanical structural limitation posed by the facet joint alignment. Hence excessive rotational elongation of the annular fibres can disrupt their integrity. If the rotational movement exceeds 5degrees, there is every chance of annular fibres disruption or failure. 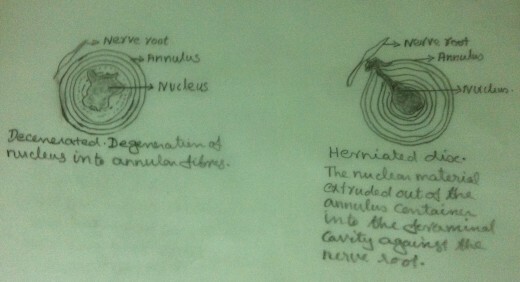 This annular tear causes loss of dynamic balance controlling the nuclear forces. Usually, tears in the annular container appear early in the border between the nucleus and the vertebral endplates. These tears gradually extend towards the centre of the nucleus. These tears are enhanced by the trauma caused by everyday activities. Initially these tears are concentric. Gradually these concentric tears get converted into radial tears due to intradiscal pressure. The degradation of the mucopolysaccharides into inferior type of polysaccharides (which absorbs excessive water but cannot retain it within the matrix) and the damage caused to the annulus causes impairment of fluid balance within the disc. With less hydrodynamic, there occurs abnormal movement in the functional unit. The adjacent vertebral endplates approximate. On prolonged flexion, ‘creep’ occurs between vertebrae and further degeneration occurs. Thus by early adult life the discs become avascular (please refer ‘How back pain works?’ Part 1) and degenerative changes set in followed by a progressive reduction in water content. 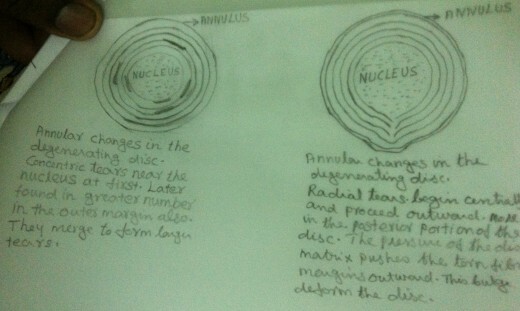 Such degenerative changes of the disc result in extrusion of the contents of the nucleus pulposus through the weakened portions of the annular fibrosus. Such extrusion may occur through the vertebral plate into the adjacent vertebra. These nodes are called ‘Schmorl’s Nodes’ which are harmless. But multiple nodes may lead to degenerative changes and may result in loss of height. Due to disc degeneration the anterior weight bearing portion of the functional unit narrows. There is approximation of the adjacent vertebral endplates anteriorly. Posteriorly the facet joints also approximate. The approximation of the facet joints may result in ‘wear and tear’ because of abnormal weight bearing and shear forces. The ‘wear and tear ‘results capsule thickening, cartilage degeneration and the invasion of fibrous repair tissue into the degenerated cartilage. There are numerous unmyelinated nerve fibres into the thickened capsule and within the invading fibrous repair tissue. These unmyelinated nerve fibres can transmit pain. The denuded bone, normally covered by cartilage, is now exposed. The denuded bone is also supplied by sensory nerve fibres. The facet joint restrict movements and they also transmit painful nociceptive impulses. All these changes that have occurred in the disc, in the foramina, in the joint capsules, facet joints, cartilage and the concerned bones are gradual and lead to a condition called ‘Spondylosis’. The greatest degree of disc degeneration is noted at the Lumbar region (L4-L5 and L5-S1). This may be because it is at this level that there is the greatest degree of angulation and the greatest degree of normal movement. How Spondylitic changes affect the functional unit? As we know, in the intact functional unit, the intrinsic pressure within the disc (both within the nucleus and the annulus) keep the adjacent vertebral bodies apart. The longitudinal ligaments (anterior and posterior) and the intervertebral annular fibres are kept taut and a pressure gradient is well maintained. When the intrinsic pressure within the disc is upset by the impaired inhibitory quality of the polysaccharide of the nucleus of the disc or because of the traumatic influence, the tension on the longitudinal ligament is diminished. But the intrinsic pressure, though upset, within the disc persists. This upset intrinsic pressure causes the loosened ligaments to avulse from their periosteal attachment to the vertebral bodies. The nucleus matrix now extrudes from between the vertebral endplates into the space between the longitudinal ligaments and the periosteum. This area of the vertebral periosteum can undergo inflammatory changes. 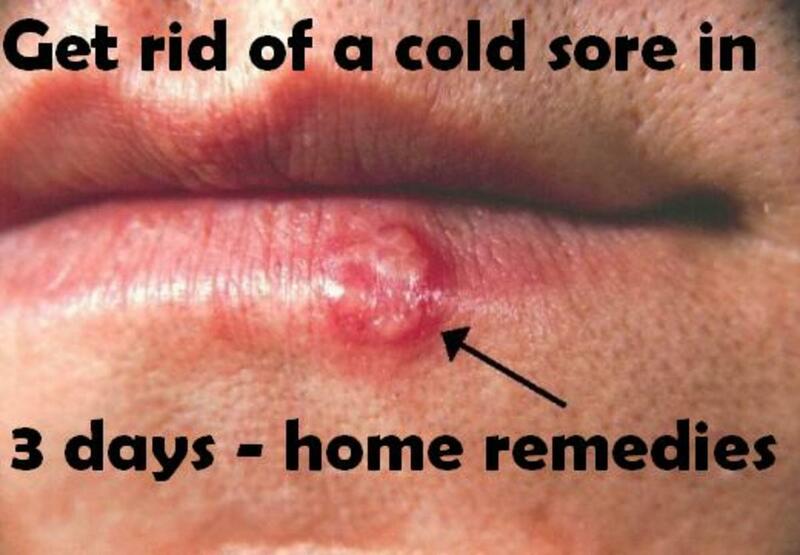 This area may be invaded by haemorrhage or fibrous tissue. There is also extruded nuclear material. At first the extruded material that has invaded the space between the longitudinal ligaments and the periosteum forms a ‘soft spur like’ tumour. This ‘soft spur like’ tumour gets calcified and becomes an ‘Osteoarthritis Spur’. In the beginning, during the evolution of the spur formation, the longitudinal ligaments are kept taut and there is no instability of the functional unit. But as further changes occur within the disc and within the longitudinal ligaments the stability of the functional unit will be adversely affected. This results in abnormal movement of the functional unit. These ‘spurs’ encroach within the foramina and lead to foraminal stenosis. The degenerative changes that occur in the cartilage of the facet joints may also encroach upon the foramina. Early morning stiffness - This is a feeling of lack of flexibility. It gradually improves with the local application of heat and gradual flexibility exercises. 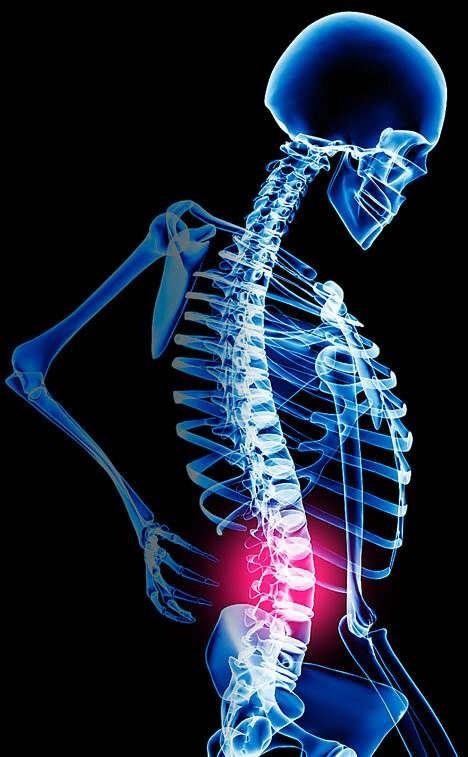 Generalised low back aching from prolonged inactivity such as sitting for a long time. Low back loses flexibility. The patient has the feeling of ‘freezing’. A limitation of movement is noted in bending, twisting, turning etc. Relief is noted on the application of local heat. Pain and paraesthesia felt down the distribution of the particular involved nerve. There may be a feeling of ‘numbness’ down the dermatome of the involved nerve root. Weakness of specific myotome – A myotome is the medical term used to denote the muscular group innervated by a specific nerve root. In testing the integrity of the nerve root, not only its strength but also its endurance must be tested. (Please refer ‘How back pain works? Part 3 Lumbar Disc Herniation’). Tenderness of the muscle innervated by a specific myotome or a specific dermatome also reveals impairment. The spine assumes an acute Scoliosis and limited motion. Flexion is limited and extension is painful. (Please refer ‘How back pain works? Part 3 Lumbar Disc Herniation’). Straight Leg Raising Test (for Sciatic Nerve) – SLR positive with positive dural sign. (Please refer ‘How back pain works? 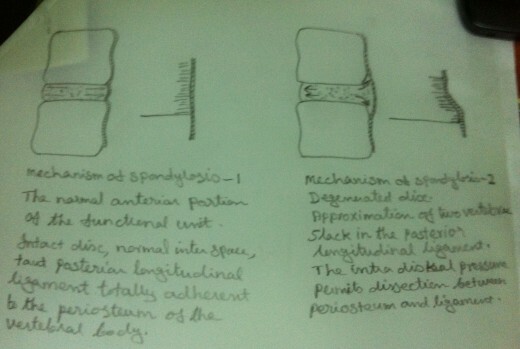 Part 3 Lumbar Disc Herniation’). Test for Femoral Nerve Involvement (please refer ‘How back pain works? 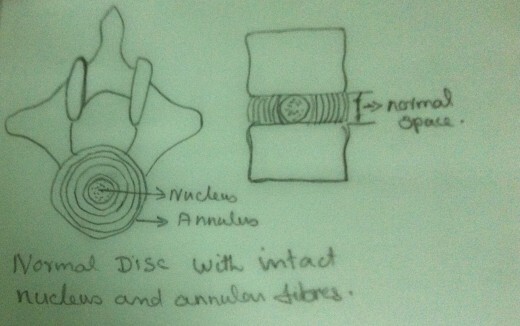 Part 3 Lumbar Disc Herniation’). Positive neurological Signs may be elicited implicating a specific nerve root and thus a specific disc level. X – rays – reveals ‘Tropism’ (asymmetry of weight bearing and alignment of the lumbosacral articulation). The disc is narrowed irregularly. A segmental scoliosis is seen on A – P views. An asymmetrical facet joint degeneration is noted on oblique views. 14. Cauda Equina Compression is most serious. Involvement of all the nerves may occur with profound motor and sensory changes. ‘Saddle Anaesthesia’ and absence of tone of the buttocks muscles are signs of S3 - 5 root damage. Sometimes sacral nerves involvement may produce sphincter disturbances with retention of urine and faeces. Patients suffering from lumbar spondylosis may have poor general conditioning, poor muscle tone, excessive flabbiness, poor posture and limited flexibility. Same as in the case of Lumbar Disc Herniation (Please refer ‘How back pain works? Part 3 Lumbar Disc Herniation’). Prevention of recurrence is difficult because the problem is anatomically mechanical. Principles of ’How to take care of your back? Plays an important role in preventing its recurrence (Please refer ‘How to take care of your back?’). Teaching the susceptible person how the spine normally function and how the segmental scholiosis prevent normal function is very important. Instituting proper body function in everyday activities is very important.